Product prices and availability are accurate as of 2019-04-18 08:25:56 EDT and are subject to change. Any price and availability information displayed on http://www.amazon.com/ at the time of purchase will apply to the purchase of this product. 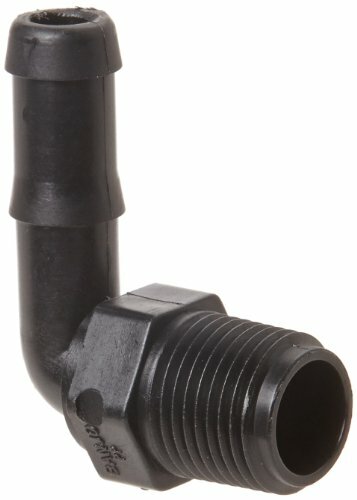 This Banjo HB050-90 barbed hose 90-degree elbow is made of glass-reinforced polypropylene and has a 1/2" barbed connection on one end and a 1/2" male NPT threaded connection on the other to connect a tube or a hose to a female NPT threaded connection at a 90-degree angle to change the direction of flow. This schedule 80 elbow is made of glass-reinforced polypropylene for rigidity, lightweight, dimensional stability, and resistance to high impact, heat, corrosion, and most chemicals. The barbed connection creates a tight seal on a tube or hose, and the male National Pipe Taper (NPT) threaded end connects with a female NPT threaded connection. The integral 15/16" hex nut provides a gripping surface for a wrench when tightening the fitting. 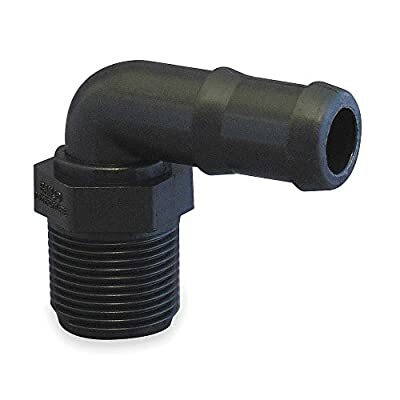 The maximum working pressure for this fitting is 150 pounds per square inch (psi) at 70 degrees F. This barbed hose elbow is suitable for use in agricultural and industrial systems for liquid flow applications. Banjo manufactures valves, couplings, pumps, pipe and hose fittings, and other fluid handling products for industrial applications. The company, founded in 1995, is headquartered in Crawfordsville, IN.